It's sold at Target and some Babies R' Us locations for only $24.99. You can't go wrong. My daughter gets uneasy in a high chair and uses the foot rest on them to stand up and try to get out. With this booster, she can't do that and she stays seated through the end of a meal. Sitting in a chair with the rest of us at the same level must make her feel better and more part of the group. Either way, it has been an excellent product for us. It's perfect for a 16 month old Portia. I LOVE it. My daughter is 2 and this is what we use at home, at my mom's and at restaurants. We use it so much we have to get another one!! It's perfect because you can put the food inside and, when he starts eating restaurant foods if he's not already, you can use it as a diaper bag/high chair since you won't need to store food in there. I store 2-3 diapers, some dry snacks, wipes & my daughter's water bottle so it's a booster and high chair in one. Honestly, by far one of the best kid's products around! 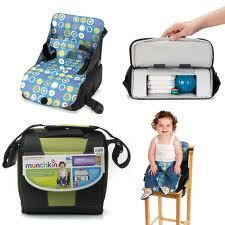 Your contents are moving ahead with days persevere guys best infant toddler carrier.